Chickpea Salad with French Feta and lemon vinaigrette is wonderful served as a light, meatless lunch with a wedge of warm flatbread, or as a side dish to your favorite grilled meats and seafood. Originally published June 2, 2014. My mother has been making chickpea salad for as long as I can remember. It’s one of those dishes that I’ve always made “by eye,” so it was fun to finally measure everything out when preparing it for the blog. 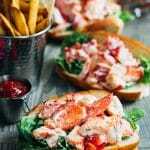 With that in mind, it’s also the kind of dish that’s very adaptable to your personal tastes. 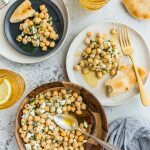 The salad is simple yet satisfying, combining hearty chickpeas with creamy French Feta, lemon juice, garlic, and olive oil. I add fresh parsley year-round, but during the summer months when fresh herbs are at their peak, I like to introduce other flavors. Fresh basil is lovely, as are thyme leaves, a hint of oregano, or even a little chopped mint. Chickpea salad is a great side dish for grilled chicken or lamb chops. Personally, I like it best served on its own with nothing more than a fork and a warm wedge of naan to dip in the lemon vinaigrette at the bottom of the bowl. Perfect for a meatless lunch. Chickpeas (also known as garbanzo beans and ceci) are my favorite member of the legume family. They’re delicately-flavored, packed with protein and nutrients, naturally gluten-free. Chickpeas are most commonly sold as the beige beans pictured here, but there are also green, purple, red, and black varieties. As a pantry staple, I love how versatile chickpeas are. There are so many possible chickpea recipes! 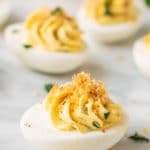 You can serve them spiced and baked for a guilt-free snack, blended as the base roasted red pepper hummus, or to make hearty meatless soups and stews. Try folding them into couscous salad for a protein boost, or dress them as the star ingredient for chickpea salad, as I’ve done here. Should I use canned or dried chickpeas for chickpea salad? Honestly, I use both. My pantry always has cans of chickpeas on the shelf, as a matter of time and convenience. When I want to make a recipe like this chickpea salad, particularly on a busy weeknight, I haven’t always had the foresight to plan ahead in soaking and boiling the beans. That said, when the scheduling stars align, freshly-cooked chickpeas are my first choice. I find that cooked, dried chickpeas tend to be more buttery in texture than the canned variety, with a deeper flavor. The texture pairs especially well with the French Feta in this recipe. Freshly-cooked chickpeas are also freezable, so if you make a batch in advance and store them, they can be just as convenient as canned. While I haven’t yet tried it myself, I’ve read that dried chickpeas cook quickly in an electric pressure cooker or Instant Pot. 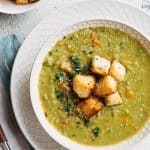 This method from The Kitchn cuts the overnight soak down to 1 minute, and the two-hour simmer down to 15 minutes. Have you made dried chickpeas from in the pressure cooker or Instant Pot? Let me know your experiences in the comments! Did you say French Feta? I thought Feta was Greek! Greek Feta is delicious, and while it’s the variety you’ll find most often in grocery stores, French and Bulgarian Fetas are treats you shouldn’t miss. My favorite is French Feta. It tends to be a bit milder in flavor than the Greek and Bulgarian varieties, less salty, and creamier in texture. 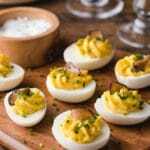 Since its flavor doesn’t overpower, it’s very versatile in recipes, from garbanzo bean salad to crostini toppings and whipped spreads. French Feta is also perfectly wonderful on its own, snuck directly out of the container for a snack, maybe with a few olives and sliced baguette on the side; not that I know anything about that! I have to say that with all of the hashtag food themes that popping up on social media, I’m a little disappointed that Feta hasn’t yet gotten its due. Amongst #MeatlessMonday, #TacoTuesday, and #SlowCookSunday, can we please start a grassroots campaign for #FetaFriday? Who’s with me? 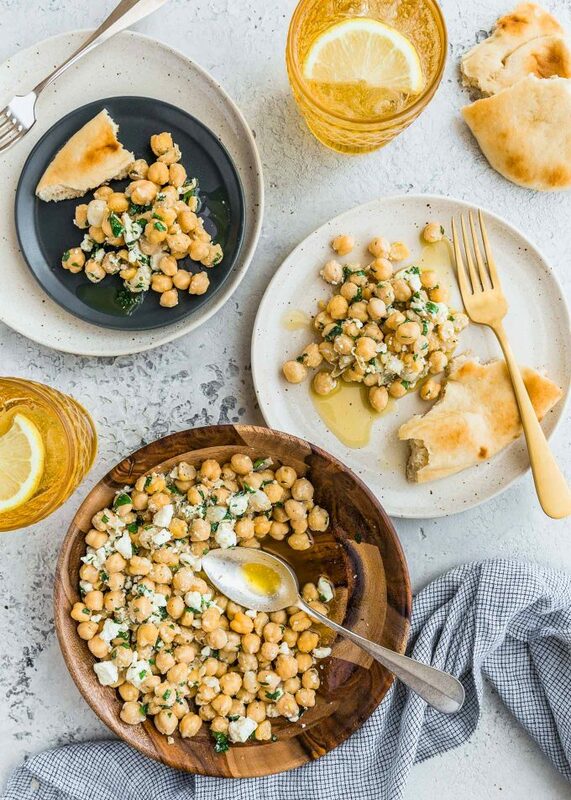 Chickpea and Feta Salad is wonderful served as a light lunch with a wedge of warm flatbread, or as a side dish to an array of grilled meats and seafood. Sort through dried chickpeas to remove any stones or discolored beans. 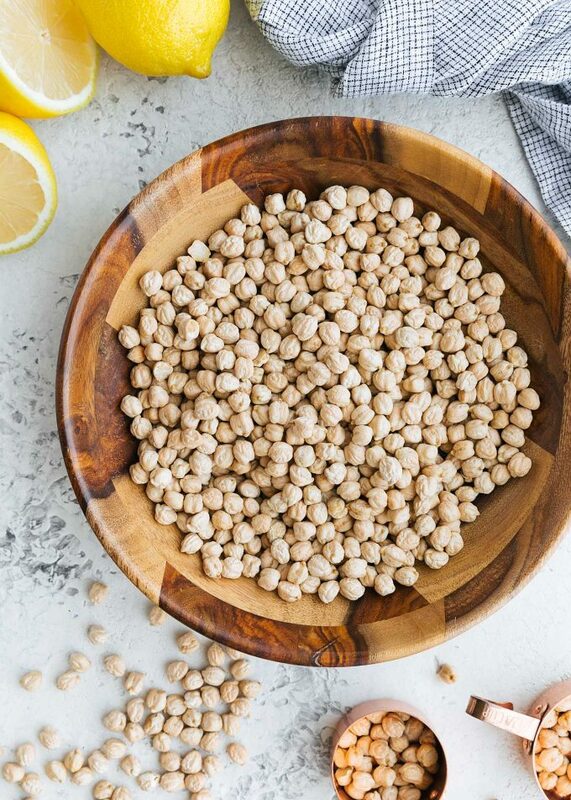 Rinse chickpeas and place in a large bowl with enough water to cover by about 2 inches. Soak overnight (12-hours). Drain and transfer soaked chickpeas to a large pot. Fill with water to cover chickpeas by 2-3 inches and bring to a boil over high heat. Reduce heat and simmer for 1-1/2 to 2 hours, until chickpeas are tender, but not mushy. Drain and cool until just slightly warm or room temperature. Makes about 3 cups cooked chickpeas. Gently dry chickpeas between a double-layer of paper towels, discarding any loosened skins. Gently stir salad and fold in crumbled Feta. Season to taste with additional salt and pepper and serve. 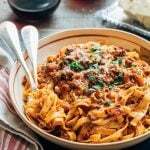 *Either canned or dried chickpeas can be used as a starting point here with good results; it's up to your personal preferences and what's handy in your pantry. 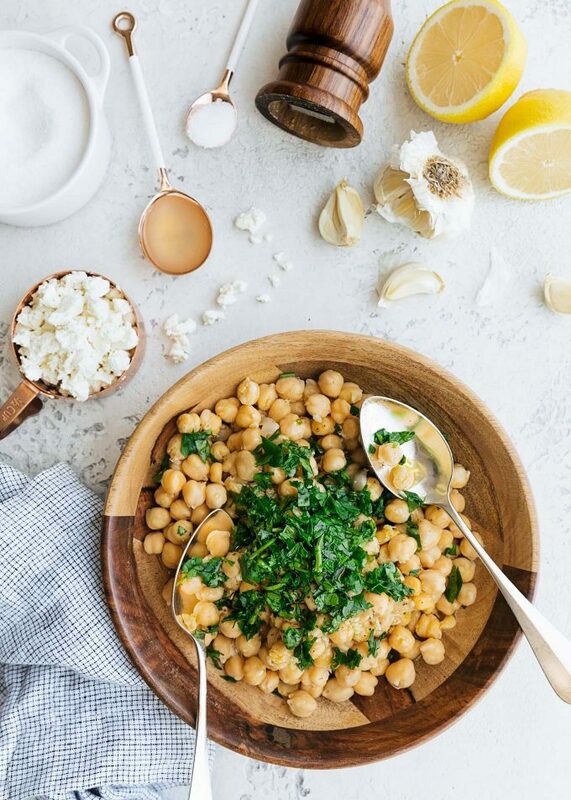 **I always use 5 tablespoons of extra virgin olive oil for the brand of chickpeas I buy, but less plump chickpeas sometimes only need 4 tablespoons (or 1/4 cup). (That's not to say that residual lemon-garlic olive oil in the bowl is a bad thing, especially if you have dipping bread around!) Less olive oil will also make the salad a little bit more "lemony." Adjust the olive oil and lemon juice to taste. 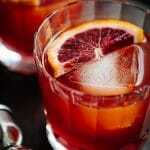 ***Longer chill times result in better flavor, but you might find that the olive oil solidifies a bit. This is normal! The dressing will return to proper texture at room temperature. Just let the salad sit out on the counter for 20 minutes or so, stirring occasionally, or microwave (before adding Feta) for 5 - 8 seconds. 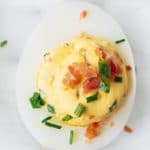 Have you made this recipe? 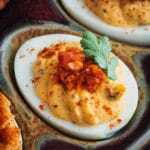 Let me know by leaving a comment and rating the recipe below! 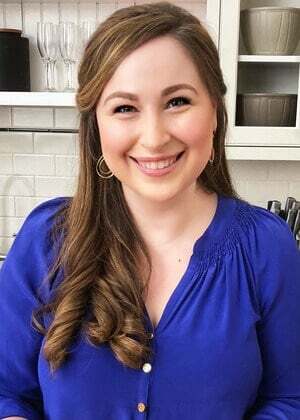 Don’t forget to take a picture and tag @stripedspatula and #stripedspatula on Instagram for a chance to be featured in my newsletter! This is just gorgeous and I’m dying to make this for lunch one of these days when it isn’t so rainy! 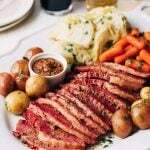 I love those recipes that are done “by hand” and figuring out how to capture that knowledge since we have a bunch like that where grandmas or aunts who were “famous” for such-and-such recipe have passed on and no one can quite recreate the dish anymore! 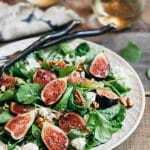 The flavors and textures in this salad are just so fantastic! YUM! A local cafe makes similar salad and I have always wanted to replicate it at home, I need to try this version out. I also need to try out that instant pot method of cooking the chickpeas, I like the sound of a faster soak and cook time! I love chickpeas and I almost always have a few cans on hand! I need to start buying raw chickpeas- but I’ll probably keep being lazy :D This looks fabulous- I want it for lunch tomorrow! What a lovely and flavorful salad! 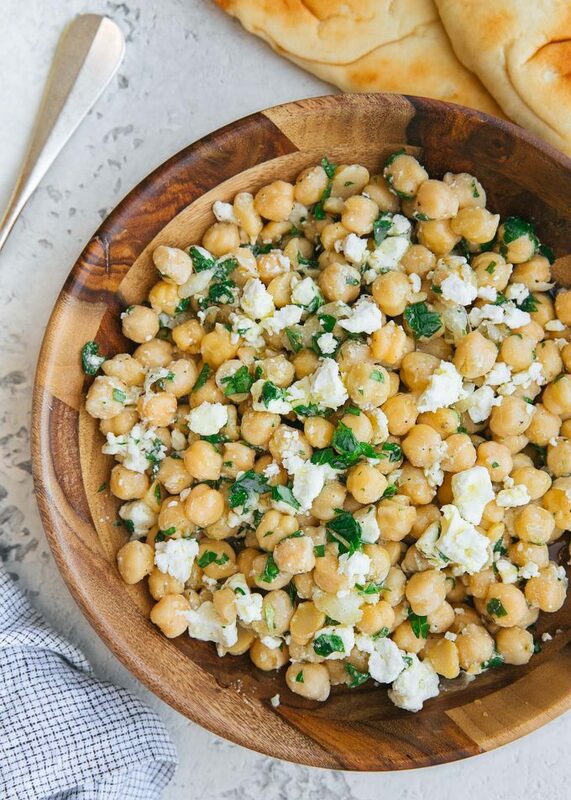 I love feta with chickpeas together! Ok…yes to everything about this salad! 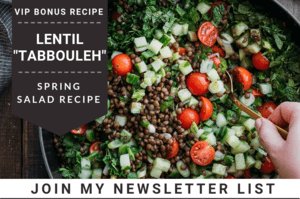 Chickpeas are also my go to legume and I love that I can used canned or dried! I’m printing out this salad right now and I’m definately making it this week! So healthy – I love this! First of all… First photo – STUNNING! The styling is just spot on with so many layers and textures that compliment each other. I keep just studying it over and over again! Second – wow, I didn’t even know that there were so many varieties of chickpeas. I’ve only seen the beige one but now I’m curious to see all the other coloured versions. I bet combined together they would make a stunning colourful chickpea dish. I love non-greek Fetas. Russian stores usually carry about 5-6 different kinds and I like to try them out before buying. I like bulgarian feta a lot. I love cooking with chickpeas! They are fantastic in salads, soups, dips, and even when ground into flour to bake with! 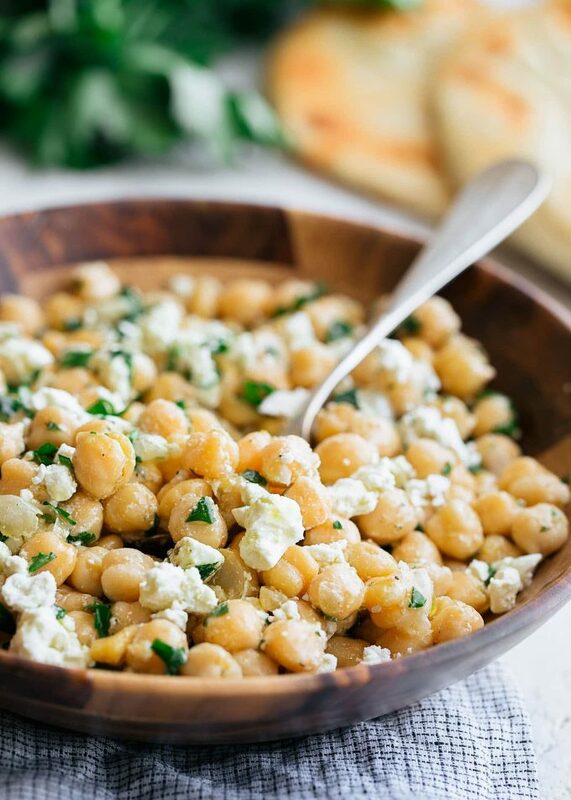 This chickpea and feta salad looks delicious… I can’t wait to make it once the weather warms up a bit and serve it with grilled chicken. Definitely pinning!